Len Laviolette has been a staunch supporter of M4CG since the early days, and we have long admired his genius and craftmanship as a luthier. But don't take our word for it; visit his web site and see his beautiful instruments in the Gallery or better still, watch a few pros playing them! I was born in Winnipeg, Manitoba. My family emigrated to San Diego in my high school years. I have been married to Dianne for 41 years. Professionally I was a land surveyor in private civil engineering for 35 years. I had been a dedicated woodworking hobbyist all my life, designing and building furniture and had some success designing liturgical furniture and sanctuaries for several church renovations. A work buddy asked if I would be interested in building him an 8-string classical guitar. I had to decline because I had never done such a thing. Coincidentally within a couple of days I saw Irving Sloane's book "Classical Guitar Construction" on a rack in a book store. I was off and running. I still refer to that ragged old book all the time. While working full time at surveying I built guitars as much as I could. For the last 6 years (since retirement) I have been building guitars as an avocation. I am very blessed to have the means and good health to continue doing this. When I am not working on a commissioned instrument I love to experiment with new guitar designs. The most fun is when a professional guitarist comes by to check an instrument. I leave him alone in the "studio" room and Dianne and I get to listen to him play from the hallway. 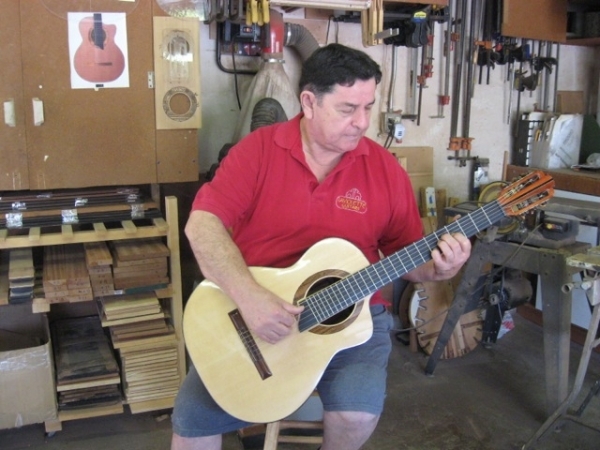 I have been a member of the Guild of American Luthiers for 27 years and have played in the Mesa College Classical Guitar Ensemble for 5 years under the direction of George Svoboda. Much of our repertoire comes from M4CG!